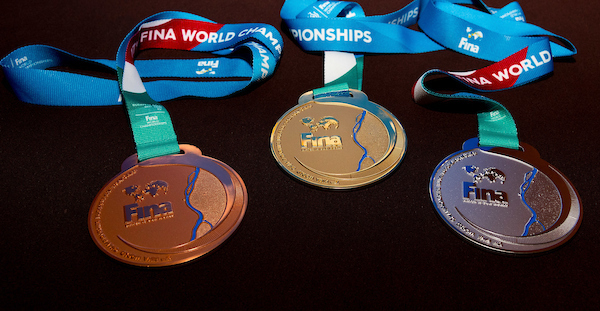 Europeans enjoyed another fine day in Budapest and Balatonfured at the 17th FINA World Championships. Medals in all three disciplines, gold in synchro and open water and dominating start in the women’s water polo – this is how Day 2 looked like from European perspective. France made 2 for 2 in open water swimming at Lake Balaton. After Marc-Antoine Olivier’s fine win in the 5km, compatriot Aurelie Muller retained her 10km title. It was a straight-forward win for the Frenchwoman who managed to leave all rivals as well as all the bad memories behind (she was disqualified in Rio, losing her silver medal). She produced another devastating finish as she touched in with a comfortable advantage. Italy’s Arianna Bridi delivered the second medal for her team in as many days, it was a rare medal-sharing as Brazil’s Marcela Cunha was also declared bronze medallist as nothing had separated the two swimmers. In synchro, the new Russian pair of Svetlana Kolesnichenko and Aleksandra Patskevich saved their nation’s pride and despite the retirement of their legends Svetlana Romashina and Natalia Ishchenko, they were able to stay atop. Ukraine’s Anna Voloshyna and Yelyzaveta Yakhno clinched gold for the first time ever in the duet technical. In the diving pool Europe’s only medal went to Italy’s Giovanni Tocci in the men’s 1m final as he managed to jump in front of veteran German Patrick Hausding in the ranks – China made a 1-2 here. The women’s synchro platform, as it usually happened in recent years, was the first event with no Europeans standing on the podium. Tonia Couch and Lois Toulson came 7th as the highest ranked from the continent. The kick-off day of the women’s water polo tournament saw all favourites taking a fine start, European sides only lost to fellow European teams. The top game of the day featured Russia and Greece and the re-match of the dramatic Olympic qualifier delighted the Russians again who won 9-7 this time.